Port Elizabeth's most popular attraction consists of a complex on the beachfront that includes the Oceanarium, a museum, and a snake park. The Bayworld Oceanarium features an aquarium tank where visitors can watch a vast array of marine life through glass portholes as they glide by. This includes sharks, turtles, and rays. 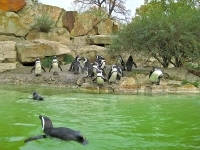 The penguins and seals are particularly entertaining while the snake park contains an impressive variety of indigenous reptiles in natural-looking enclosures. The PE Museum focuses on cultural and natural history with a wide variety of exhibits, from models of sailing ships and period costumes to giant replicas of dinosaurs that roamed the area in prehistoric times. It is the third-oldest museum in the country. Port Elizabeth has a lovely beachfront area, which is the main draw for visitors. But the city is generally just a stop-over point for tourists on their way to one of the nearby game reserves. If you are travelling through Port Elizabeth with kids and have a bit of time to spare, visiting Bayworld is a great option.